Published: May 2, 2016 at 11:06 a.m. 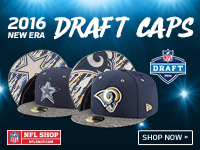 Updated: May 2, 2016 at 08:11 p.m.
For those so inclined, it is almost safe to purchase your new team jerseys. The whirl of roster remaking that is the engine of the offseason reached its effective end when the 2016 NFL Draft concluded Saturday night and the frantic signings of undrafted free agents wrapped up a few hours later. There will be some comings and goings later in the summer, as teams release rookies and young veterans to get down to the 53-man roster -- Dolphins executive Mike Tannenbaum, then with the Jets, called it the mini-draft -- but for the most part, you can start perusing your team's roster for your new favorite. Trying to assess how each team did in the draft as soon as it ends is a water-cooler exercise for fans and reporters, but it is considered folly by the personnel executives who know best. "When we scout players and evaluate players, we talk about what they are going to be in their second year," Tennessee Titans general manager Jon Robinson said during the draft. "It's such a big transition for college players to make that transition from the college game to the pro game." The AFC South, for years a virtual Indianapolis Colts walkover, is soon going to be one of the most competitive divisions in the league. 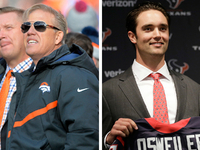 The offseason signing of Brock Osweiler by the division-champion Texans means every team has what they believe to be a franchise quarterback for years to come. But it was the drafts of the Titans and Jaguars this past week that signaled a four-team race is on the horizon. 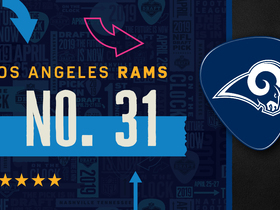 Robinson was the pre-draft winner (and that doesn't even count his cheap trade for DeMarco Murray) when he dealt the first overall pick to the Los Angeles Rams for a bounty that will help fuel the franchise's roster for years. 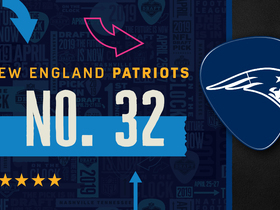 As a result, the Titans had five of the top 64 picks in the draft and used them on the sort of big, tough players that set a tone and can take some of the load off Marcus Mariota. Enter tackle Jack Conklin with the Titans' first pick (which came at No. 8 overall, after another Tennessee trade Thursday night), a load of defensive plays and running back Derrick Henry, the kind of bruising rusher few defenders will look forward to repeatedly squaring up. If there is a concern, it is that Conklin is the only sure-fire starter from the minute he arrives. But that is OK with the Titans. Robinson and Co. knew they had a massive roster overhaul ahead of them, and they are, as the first-year GM indicated himself, thinking long term. The Jaguars have been thinking long term for a few years now, and their patient approach to one of the biggest roster overhauls imaginable might finally bear fruit in 2016. Gus Bradley came from the Seattle Seahawks, and his defense might eventually be as scary as that of his former employer. The Jags signed defensive lineman Malik Jackson in free agency and they get last year's first-round pick Dante Fowler Jr. back from an injury that ended his rookie season before it began. But it was the first two picks that had us wondering if Bradley was doing cartwheels in the draft room. The Jaguars got defensive back Jalen Ramsey in the first round, scooping up arguably the best defensive player in the draft. Ramsey is 6-foot-1 (a big corner -- does that sound familiar?) and can play just about any position in the secondary. Then the Jaguars lucked into getting Myles Jack, the superb UCLA linebacker, in the second round, as concerns about the future health of Jack's knee scared teams from drafting him on Thursday. That gave the Jaguars the top two defensive players in the draft, a staggering haul for a team that was 31st in points allowed last season and knows it has six games per year against Andrew Luck, Osweiler and Mariota. For a long time, Colts owner Jim Irsay could practically pencil his team into the playoffs. Not anymore. "I can't call us the team to beat in the division, because Houston won the division. Jacksonville took it to us when we were down there in a big way. We have a lot to prove," Irsay told Indianapolis reporters on Saturday. "We feel like we can get right back into the mix, but we have to prove it. There's no doubt about it. We know the division will be a lot better." When Lovie Smith was the coach in Tampa Bay, the Buccaneers made a concerted effort to focus on the offense, the unit that had been his undoing in his previous stop with the Bears. 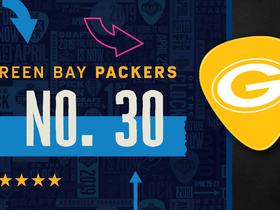 In his two drafts there, the Bucs used just one pick on defense. When Smith was fired after the 2015 season, it was reported that one of the reasons was ownership's concern about the regression of the defense, which last year ranked 26th in points allowed. The front office clearly got the message, with new head coach Dirk Koetter, who was elevated from offensive coordinator, the beneficiary. While the Bucs caused eyebrows to raise when they traded up in the second round to draft a kicker, Roberto Aguayo, the organization used four of its seven picks on defensive players -- including cornerback Vernon Hargreaves III, who came off the board at No. 11 overall, and second-round pass rusher Noah Spence, who has prodigious talent but had to leave Ohio State following multiple failed drug tests. Spence also has an arrest for alcohol intoxication and disorderly conduct in his past (the charges eventually were expunged from his record), but the Bucs are well-versed in conducting background checks and taking chances on players with significant concerns on their résumés, as they did -- to their benefit -- with Jameis Winston last year. When asked if he wanted to draft an offensive player on the first day, Koetter could only laugh. "I don't think anybody could look anybody else in the eye and say that we need to be drafting offense," Koetter said. "We need to draft on defense. There's a lot of good football players out there. Let's hope next year we're not picking at nine [Tampa's original draft slot in 2016]. Let's hope we're picking a lot further back." 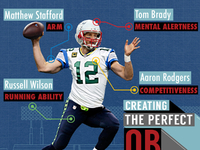 Quarterbacks fly off the board, but how many are ready to roll? Fifteen quarterbacks were selected -- way up from just seven last year -- but while both Winston and Mariota started immediately in their rookie seasons, only No. 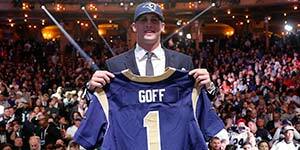 1 overall pick Jared Goff (Rams) is expected to be a starter when the season begins. After the Broncos moved up late in the first round to take Paxton Lynch -- who will be groomed behind Mark Sanchez to be Denver's starter of the future -- the Jets caused the biggest stir when they selected Penn State's Christian Hackenberg in the second round. Hackenberg was famously erratic in Happy Valley, and he is now the third developmental quarterback on New York's roster, joining Geno Smith and Bryce Petty. 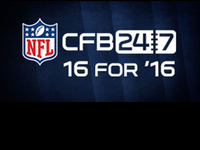 Hackenberg is not viewed as likely to be ready to play this season. Smith will be the starter during offseason workouts, but that begs the question: whither Ryan Fitzpatrick? The Jets reiterated multiple times during the draft that they want Fitzpatrick back, and with the Broncos' move to get Lynch, it would seem Fitz's other options are non-existent. But just after the draft ended, the Chicago Bears signed Brian Hoyer, who would have been an option for the Jets if they can't reach terms with Fitzpatrick. GM Mike Maccagnan told reporters Saturday the Jets are not in discussions with any other team about acquiring a quarterback, so forget about Nick Foles or anyone else for a while. And take a deep breath: Coach Todd Bowles said it's not critical that Fitzpatrick be with the team before training camp opens late in July. Still, until it is settled, the Jets' quarterback situation -- no current starter and a roomful of players who might not be quarterbacks of the future -- will rank alongside those in San Francisco and Philadelphia as the most unsettled and potentially headache-inducing for the rest of the offseason. » What do the numbers tell us? The proliferation across the NFL of many-receiver sets -- and the time defenses spend in nickel formation -- is clear in the number of defensive backs drafted: 52, including 31 in the first four rounds. » The Cleveland Browns, who obviously are going to do things in an interesting way, used four of their 14 picks on wide receivers, including first-rounder Corey Coleman. It's worth noting that in 2014, when the Browns knew they were about to lose Josh Gordon to a suspension, they did not draft a receiver at all and they drafted just one last year. Also intriguing: Despite what would seem to be a glaring need, the Browns did not draft a quarterback who is likely to be their starter of the future. Cody Kessler of USC was taken in the third round, but it will be a surprise if he eventually emerges as a long-term starter, regardless of how Robert Griffin III performs. Executive vice president Sashi Brown took issue with the idea that Cleveland is not giving Griffin much competition -- he advised everyone not to sleep on Kessler -- but the stockpiling of draft picks (two firsts and two seconds in 2017) indicates the Browns are taking the long view in this latest iteration of an overhaul. Even if RGIII is nothing more than a stop-gap measure, this regime will have more cracks at finally settling the game's most important job. In the meantime, the addition of so many receivers can't hurt. "I think you can never have too much talent or competition at that position, because I think it helps improve your quarterback position," new Browns coach Hue Jackson said. "As I said, the quarterback is the guy that kind of drives the engine here, and we are going to do everything that we can to put him in a position to succeed." » The Giants, for the first time in their long franchise history -- 81 drafts, dating to 1936 -- did not take an offensive or defensive lineman. That is ... odd. The lack of a drafted defensive lineman is not as pressing -- during the Giants' busy free agency, they spent a fortune to sign Olivier Vernon and Damon Harrison. 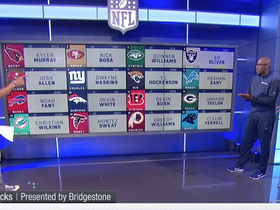 But the offensive line received no such attention in free agency and the Giants passed over the unit in the draft for the first time since 2008, a surprise considering the right side of the line seemed to be a need heading into last week. 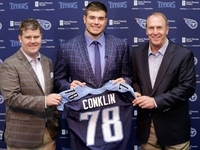 The Giants had targeted Conklin in the first round before they were jumped by the Titans, and they passed on Laremy Tunsil in the midst of his wild draft night. "The story is yet to be written on the right side of the offensive line," first-year coach Ben McAdoo said. "We're just starting the 2016 offseason. We're going to look at every possible combination, give guys a chance to compete and see where it goes from there. It's still early." » After Andrew Luck's 2015 season was shortened by injury, how much of a priority did Indianapolis place on protecting its franchise QB? The Colts used four of their eight picks on offensive linemen, getting Luck the center for what should be the rest of his career in first-rounder Ryan Kelly. "We're ecstatic about what we've done with the offensive line," Irsay said. "Obviously we all remember our Super Bowl win in that season was really led by the offensive line -- even in the Super Bowl game, blocking so well, doing such a great job in the second half of the championship game against the Patriots. We just have a great recall about how important the offensive line is."